Along the Colorado River in the United States is a unique area known as the Painted Desert. 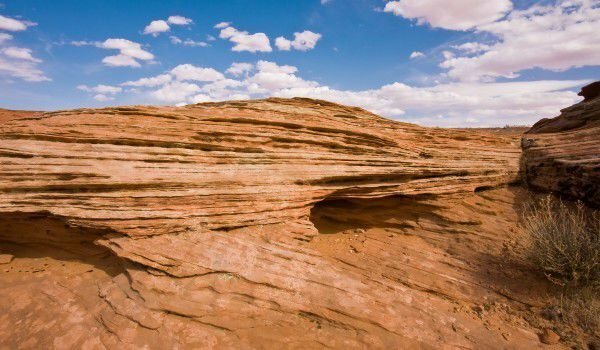 This interesting rock area is located southeast of the Grand Canyon and is part of the national park "Petrified Forest". The Painted Desert is composed of interesting rocks, dyed in yellow, red, brown and orange stripes. They are the same type as chili. From the valleys rise the heavily eroded slopes of the high plateaus. The look of the reddish rocks and naked hills is due to the fact that they contain many different minerals combined with animal and plant remains. At sunrise and sunset, the slopes even have violet and blue shades. Not surprisingly, the Spanish colonists, which first step in these places, called the area El Desierto Pintado, from the Motley appearance of the landscape. Due to ongoing erosion, mainly due to strong winds, the general view is constantly changing. The surface rock layer is constantly collapsing, resulting in the lower layers appearing, which have numerous other fossils. Quite interesting is the visit of the national park Petrified Forest in which are preserved remains of coniferous trees, some dating back 22 million years, when it was the epoch of the Trias. These trees are able to persist due to the natural features of the area - when they are buried under volcanic ash and mud, they can not begin to decompose. In conjunction with the silicate-rich ground water, this formed silica, which sealed the trees. This natural phenomenon is most manifested here, in the Painted Desert. In the past, the Painted Desert was the bottom of a large watered valley, which was cut by numerous rivers and streams, and around it grew dense forests of conifers. Tourists who visit the Petrified Forest are forbidden from leaving the identified routes and touching the wood, because it is very fragile and their breaking happens easily.